I posted on my Facebook page yesterday a comment about planting daylilies in drifts of similar or complimentary colours/sizes. Here’s a happy accident of exactly that concept. These are my own hybrids, and since they ended up together, it’s possible they were from the same parents. But again, just like your kids are all different, but with some features of both parents and therefore likely will have some common traits among them, these two different day lilies have similar traits. Monochromic–different shades of the same hue (have I got that right? ), and with the same yellow centres. But the darker one is conveniently taller than the lighter, so both show off to advantage. They’re doing alright in almost full shade with a lot of bright light around, and only two years old–still babies, so I’ll leave them in this spot, will have more (of a “drift”) next year, and I’ll find out how they like the amount of shade. Which leads me to an interesting concept: you don’t have to have it all right, all at once. My garden is very much a work in progress, and I expect it will be as long as I live here. If you’re beginning your own garden design, be patient and kind to yourself. Read tags (Google is your friend as well), watch the sunlight, and don’t be afraid to TRY THINGS OUT. That’s really the whole point of this Real Life Garden Solutions–giving you tools so you can TRY THINGS OUT. I’d love to see some of your happy design accidents. Post, comment, share, like–let’s get a conversation going :-). 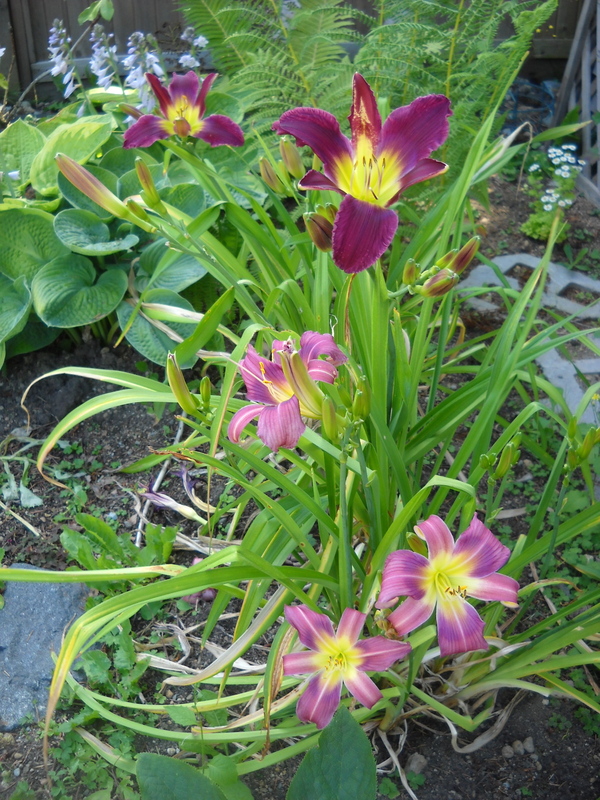 This entry was posted in design, garden and tagged day lilies, design, garden solutions, happy accident, planting daylilies by Janet. Bookmark the permalink.